You’re enjoying the view of a new development: striking new buildings surrounded by lush landscaping. Or, you’re soaking in some centuries-old classic architecture on a tree-lined boulevard. Then, your eye is drawn uncontrollably to something else…a squared-off, gray structure right in the center of your vista...a parking garage. Ugh! You might wonder why they don’t do something to cover up or disguise these relatively unsightly structures. Why not make them blend in with a some type of facade? It seems like a simple question with a simple answer. The question is simple; however, the answer is more complex. Car exhaust is not good for people, so parking garages must be capable removing bad air while bringing in fresh air. For this reason, above grade multi-story parking garages typically have an open design - to allow for the natural exchange of air. Parking garages that qualify as “open-air” or non-enclosed structures can often not avoid the need to install expensive forced (mechanical) ventilation systems. Since parking garages are considered “occupied space”, similar to office buildings, many building codes require that all of the air inside enclosed parking garages be changed at least every 5 or 6 minutes. In something as large as a parking garage, that’s a lot of air and large cost for hardware. Operating and maintaining a large forced ventilation system is, of course, also a significant ongoing expense. Even if a facade does permit natural ventilation to some extent, extensive analysis and modeling may be required to satisfy local regulations. Then, there is also the possibility that a facade necessitates a more extensive fire protection system. But, that’s not the end of the challenge. If the point of a facade is to limit visibility of the parking garage, it also limits visibility into the garage. This is contrary to the best practices for parking garage security. Limiting the view of passing motorists and pedestrians inside the parking garage creates an environment more conducive to crime. 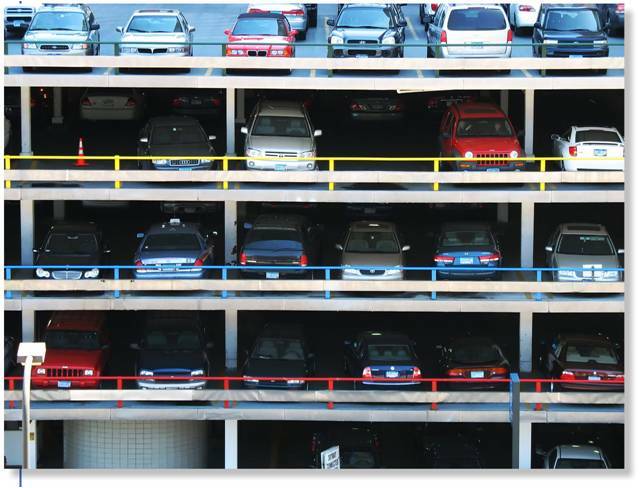 If you want car parking and architectural aesthetics, an automated car parking system may be the best and lowest cost solution. Contact Skyline Parking to find out all the ways you can achieve car parking, pleasant views and higher profits in a sustainable fashion - all at the same time.